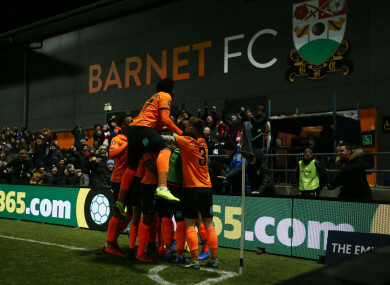 Barnet's Dan Sparkes celebrates scoring his side's third goal. Former Cork City and Limerick forward Chiedozie Ogbene was an unused substitute for Brentford on Monday, with the 21-year-old having joined the club on a three-and-a-half year contract in January 2018. Email “Non-league Barnet earn Brentford replay after six-goal FA Cup thriller”. Feedback on “Non-league Barnet earn Brentford replay after six-goal FA Cup thriller”.